Large Art is our specialty. 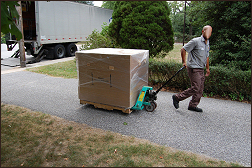 We have successfully shipped thousands of large statues to every corner of the United States. Shipping is free and we take care of everything. So if you are considering the purchase of a large sculpture, relax we have it all under control right up to delivery to your home or business. However, there are a few things you need to know about receiving your purchase so please read the following information carefully. 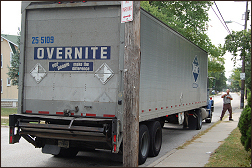 Large sculptures are sent by commercial trucking companies (typically Overnite Transportation now UPS Freight). If the sculpture is in stock you can expect delivery within 2 weeks. If it is not in stock it may be in production and we will ship as soon as it is ready. If we cast a new one for you it will take about 2 weeks plus delivery time. The worse case is always 4 weeks from order to delivery. Delivery: When the sculpture arrives at a trucking terminal near you, an appointment clerk will call you to schedule a day and time to make delivery. The trucks are equipped with a lift-gate so you do not need any type of loading dock or forklift to receive the delivery. 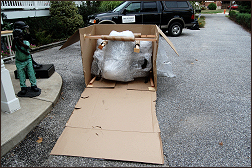 The driver will get the sculpture off of the truck and will use a pallet jack to move it a short distance so that it is out of the way. Relax - we specialize in large art so we have done this many times before. Note that generally truck drivers do not offer installation services. We have heard of drivers willing to help for a generous tip, but we do not recommend that you plan on this. We have 3 business days from delivery to report damage to the trucking company. You must get the bubble-wrap completely off of the statue as soon as possible. The bubble-wrap can leave white circles on the bronze surface if left on too long. 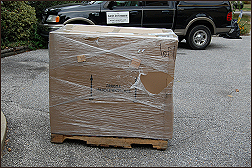 If you find any damage before or after unpacking, save all your packing materials and call us right away. We will have the damaged one picked up and repaired or replaced at no cost to you. However, we will need to have the damaged one picked up, so please save all your boxing material and bubble-wrap. When your sculpture is ready for shipping it is wrapped in bubble-wrap from top to bottom. 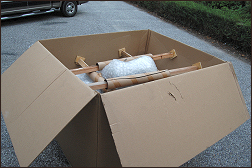 Then, the statue is placed on a wooden pallet and the pallet and the statue are wrapped in cardboard with a 2x2" wooden frame. The entire package is then wrapped in shrink-wrap. 2. Cut the tape securing the top of the box and remove the lid (if applicable). 3. Using the box cutter or scissors open one side of the box (a wide side is best) by making a cut down 2 corners from top to bottom. Be sure to look inside before you cut to make sure you don't scratch the statue. Leave the bottom attached. This will make it easy to reuse the box if any damage is discovered. 4. Using the hammer, reach inside the box and knock off the wooden frame from the side being removed. 6. Slide the statue out of the box and onto the cardboard now lying down. 7. Using the scissors, or box cutter, carefully remove the bubble-wrap from the statue. Be careful not to scratch the statue. Damage caused by unpacking the statue is not covered by our insurance or our damage replacement guarantee. 8. That should be it. You are ready to move it to its permanent location. 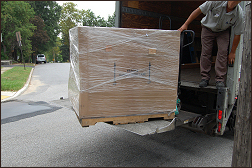 If you have any doubts or questions about shipping or unpacking PLEASE CALL (800) 785-4278.